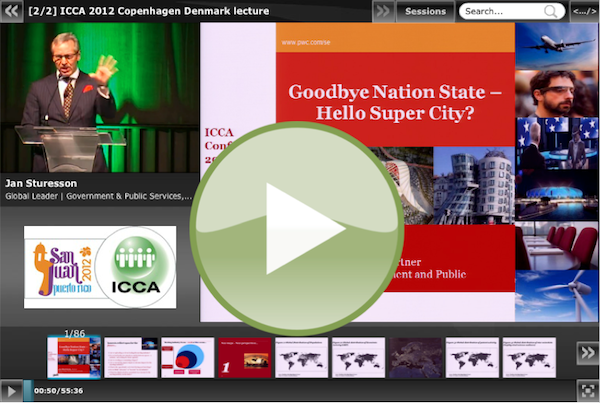 Klewel 2.0 | ICCA 2012 Keynote: Goodbye Nation State – Hello Super City? This talk is of interest to all the convention bureaux in the world as well as everyone involved with city planning in a way or another. It was recorded a couple of weeks ago at the ICCA 2012 Congress in Puerto Rico. Klewel is an active member of the ICCA international association about meeting industry. A report about this congress can be found here. We’ve all grown up in a world of inter-country competition and national identity. The Olympics and World Cup, economic league tables, the UN and World Bank: all of our leading institutions are built on the nation state. The way we look at and analyse the world has been through a national viewpoint. But this is deceptive: today geography is dramatically more complicated: New York has become closer in many ways to London and Shanghai than it is to Brooklyn; Amsterdam has fewer than 50% Dutch inhabitants; China is undertaking the most gigantic-ever urbanisation project, involving literally hundreds of millions of people. The City is fast becoming the key competitive unit in every important economic and society-wide dimension, and this is why this year’s Copenhagen-Denmark Lecturer is Jan Sturesson. Over the last decade he has become a world-leading authority on this phenomenon: leading multinational research teams, advising governments and mayors, writing hard-hitting reports, and changing perceptions all around the world. Learn about how concepts such as “issues-based industrial clustering” are being used to build competitive advantage. Understand what it takes for cities to build a strategic brand, and the internal and external challenges that need to be overcome. Consider the mega-trends that successful cities, large and small, will need to adapt to. Think about the new relationships that are likely to emerge between cities and national governments. This is a session that will forever change the framework through which you view the world.